We provide a service to plant any of the trees that we grow in our nursery, as well as undertaking a wide variety of other landscape planting works. Our horticultural staff have the experience to ensure that your trees will be correctly planted to enable them to establish and thrive in their new location. Our experience includes undertaking projects in private gardens, parks, streets, civic, subdivisions, commercial developments, institutions and schools. 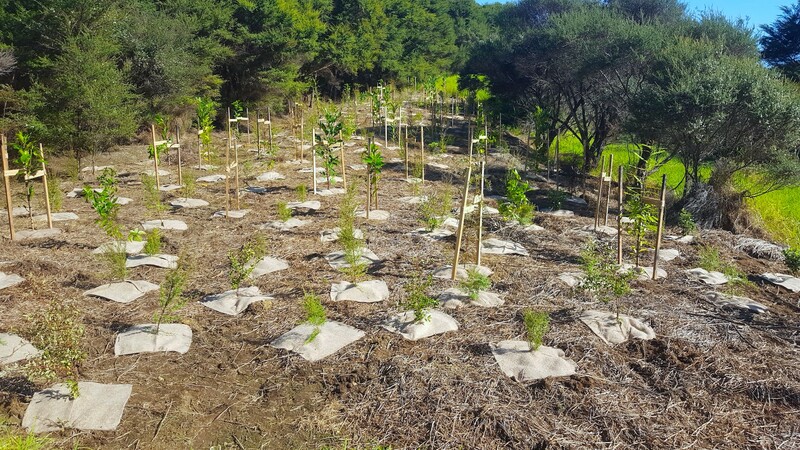 We also have experience in undertaking New Zealand native re-vegetation plantings. Correct planting is absolutely critical for tree establishment, if you are inexperienced with tree planting we highly recommend you use one of our tree planting services. We customise our planting to suit the needs of the individual. Once the tree has been planted stakes and ties must be checked every year to avoid tight tree ties damaging the stems and to replace any ties that have frayed or broken. Once the tree is then able to stand unsupported without bending or shifting in the ground, we remove the stakes. This usually takes eighteen months to three years, but may be longer for semi-mature trees or ones on weak rootstocks, such as dwarf apple trees. Larger tree specimens we often us a state of-the-art overhead or underground Platipus anchorage system. This ensures the tree successfully establishes itself within the surrounding ground and has adequate support prevent damage from the surrounding environments weather conditions.